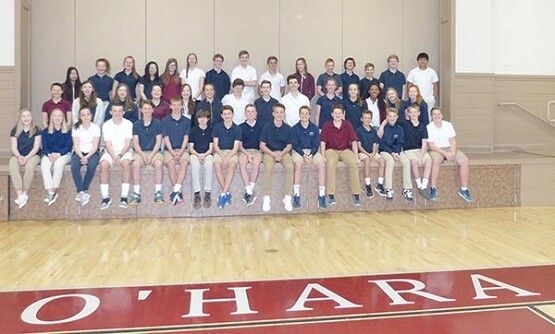 EUGENE — O’Hara will hold its graduation for 50 students at 7 p.m. Tuesday, June 13, at St. Mary Church. The graduates include: (back row) Amoline Foerstler, Celia Van Den Wymelenberg, Anika Thompson, Isabel Yu, Laura Kokkeler, Madeline Mahalak, Rogan de Calesta, Ryan Watts, Hagan Stephenson, Avery Anderson, Charlie Papé, Justin May, Derek Saxman, Dillon Jaspers and Miguel Rivas; (middle row) Abigail Hass, Isa Byrum, Maddie Meyer, Briana Howe, Jena Miko, Ava Eklund, Sam Eagen, Bene Sušec, Alec Vendetti, Anna Bouressa, Libby Korth, Madison Tuski, Whitney Korth and Ellie Christian; and (front row) Natali Hayes, Lindsey Sargent, Gloria Rear, KC Kimble, Jay Kartub, Jackson Whittaker, Liam Kaperick, Colin McDowell, Jack Thornton, Joey Laing, Peter Collins, Luke Eagen, Ryan Murphy, Ethan Cross, Sean Hurley and Jordan Lee. Not pictured are Cindy Cardenas, Kira Cosgrove, Shawn deCalesta, Logan Griffin and Tatum Pond.